In my last post I argued that crises are the result of complexity. While I still hold this argument, a crisis is probably a situation where complexity is at a maximum, if there is a maximum. The situation will probably not become more complex than that. A response I got on the previous post from John Marke was a reference to his paper ‘Why bad things happen to good policies‘. I will come back in more detail about his paper later, but one of the important statements is that all paradigmatic shifts are preceded by crises. That’s interesting, if complexity is followed by a crisis, and a crisis is followed by a paradigmatic shift, then complexity will be followed by a paradigmatic shift. Complexity can be seen as a positive feedback loop towards complexity, while a paradigmatic shift is a negative feedback loop towards a ‘stable’ but new (and temporary) equilibrium. A new equilibrium in the sense that it was not predicted or a situation that was stable before. If we can speak of systems here (depends on your point of view on systems), at least we are talking about complex systems, or complex adaptive systems. If a paradigmatic shift follows a crisis, then who or what sparks this shift to occur? It’s hard to say. In a complex environment, there is a huge network of resources that is ever-expanding. The value of a network is proportional to the square of the number of connected users of the system (Metcalfe). That makes it unpredictable where this shift is coming from, but chances are that it can come from a bottom-up, self-organized distributed sub-network within the system. A question that John Marke asks the reader in his paper is ‘how could we empower them’? First we have to identify the possible ‘we’ and ‘them’. Or shouldn’t ‘we’, and should it be more emergent? Marke poses a similar choice, adapt to the complex adaptive system, or harness complexity and have it work in your advantage. I like his way of thinking, because either you just accept the fact that you can do anything except adapt, or understand some properties of the system (emergent, unexpected, self-organized, highly connected, adaptive). The latter has more interesting possibilities, and is more congruent with these characteristics. Remember, you are probably in this complex adaptive system as well, play a role, and have the same characteristics. It’s not something totally alien. In this present situation, it is easy to understand that the situation is getting complex more quickly than it did in the past. That means that crises are about to occur more often, and the same is true for paradigmatic shifts. The thing we need to accept is that situations are not stable, and these ‘stable’ situations are volatile and temporary. Solutions are valid for a short period of time, almost by definition. And why do we want to reach a situation that worked in the past, while the environment around us keeps changing in a rapid pace? This post is my answer to the paper of John Marke. He’s in the process of writing another, on resilience, the solution space of complexity as he puts it. In the previous post I mentioned Luhmann for the first time. As his systems theory was of initial inspiration for starting this quest, I will try to elaborate on that now. Niklas Luhmann was a German sociologist, or, more striking, a social theorist, and his systems theory is very interesting to say the least, but also very difficult to grasp, not only because he has written all of his work in German. So how can his theories help me in my quest? Luhmann’s core element in his theories is communication, not people, which is fundamentally different from traditional social sciences. Communicative actions of people are constituted (but not defined) by society, and society is constituted (but not defined) by the communicative actions of people. Therefore, society is people’s environment, and people are society’s environment. His theory also states that systems evolve from their environment by chance and have no understanding of how other systems perceive their environment. This process is also known as autopoiesis (Maturana and Varela, see model on the image¹), which literally means self-creation, and is closely related to self-organization but also has some recursive elements. Now his theories are not only too theoretical and abstract for now, but also tend to be too comprehensive and raises new questions such as the double contingency problem. Therefore I will try to focus on how his theories or parts of his theories can help me. I think the concept of communication as a core element can help me. By focusing on communicative action of people and their societies, we’re talking really about an open system. An open system is a black box that itself changes its internal organization as a response to changes in its environment. When these changes in turn have an effect on the environment, a positive feedback loop is established. To answer the question in the title, Luhmann can partly help me. By seeing the society as Luhmann states it as the environment, it helps me to give direction to cope with self-organization. It helps to see the communicative actions of people and their changing environment as an open system, which reinforce and influence each other. I think I have to focus more on this reinforcement or influence. Basically this is a continuously ongoing negotiation of meaning. Negotiation of meaning is based on the tension (or duality) between reification and participation (Wenger). That makes things less abstract because it enables me to take the context of this research into account. Probably more about the negotiation of meaning in the next post. ¹) This model of autopoiesis (Maturana and Varela) covers the complete spectrum of living systems – from the smallest organisms and animals through to communities such as social insects right through to advanced human societies. Talking about self-organization is very often very theoretical. Many existing theories are interesting and are necessary to understand self-organization, for example stigmergy, autopoiesis, the rules of engagement (Wenger), empowerment, swarm intelligence, collaboration and so on. But what is also needed is to find modes or levels of self-organization (thanks Tim). That is more difficult to find out. It is difficult because self-organization is an emergent process, it is very difficult to influence the dynamics of the system or to plan things a priori. What perhaps is possible is to predict certain behavior, but that has its limitations. What can be said about human behavior is that they tend to follow some trends. That can be seen with buying products, listening to certain kinds of music, living lifestyles or following political thoughts. These behaviors can be classified as social. The same can be said about self-organization. It is an emergent process, but an emergent social process as well. Perhaps the only factor to apply with these processes is to influence human behavior. For example, if some people tend to buy certain products, other people can be influenced by that behavior and buy the same. This phenomenon is also known as positive feedback. If enough people believe that something is true, their behavior makes it true, and observations of their behavior in turn increase belief. I think the current predominant public opinion about the various crises is a good example. But the problem remains. How can an increase in organization be measured if there are no outside forces? Should it be measured from the inside instead? Measuring an emergent process can perhaps only be done while it is happening, in real-time. If that is true, monitoring of processes is extremely important. So while monitoring, what can be considered important to monitor? Social interactions between individuals is probably where to begin with. Where the system does not have direct influence on behavior, individual behavior does. People respond to behavior of others, where the behavior of all people is not controlled by outside forces, by the system so to say, but by themselves. Autopoiesis and the systems theory of Niklas Luhmann can point me in some right directions here probably. Interactions between people can have various reasons to occur. Not too long ago I read that the majority of communication between people is gossip. 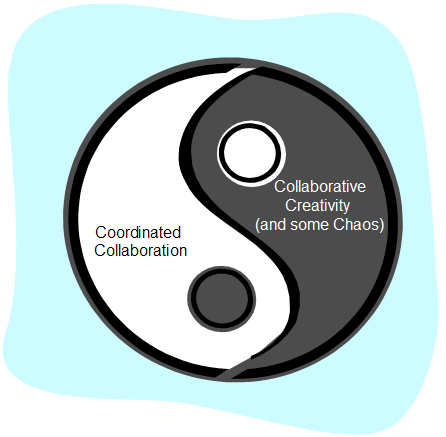 But when measuring self-organization in online collaborative spaces, people do have a shared practice. I think that gossip plays a less important (but not one to underestimate) role here. I think I will follow Tim’s tips and have a look at Wenger again. Luckily, he’s sharing the same practice at the moment by writing down a great summary of the communities of practice theory. That can point me to the right directions perhaps.